Brazil possesses approximately 329 million hectares of arable land, of which 80 million (24.3%) is allocated to annual and perennial crops, and 172 million hectares (52.1%) are used for pastures (according to Agribusiness Center of FGV - GV Agro data), as well as diverse climatic conditions, regular rainfall, abundant solar energy and nearly 13% of all fresh water available on Earth. Added to these, the country has excellent conditions for the development of agribusiness, which is currently one of the main drivers of the Brazilian economy. Fertilizers are mineral or organic compounds used to offset deficiencies of substances that are vital to the survival of plants, applied to agriculture in order to replace compounds extracted during harvesting and to increase productivity. The fertilizer industry is basically focused on the production and sale of supplements to natural minerals found in the soil, which are essential for the growth and development of plants. These products work to aid the growth of plants, together with sunlight, carbon dioxide and water. Fertilizer production is directly linked to agricultural production and to the availability of basic raw materials produced at economically feasible prices. - Essential Nutrients: Essential nutrients are those that are indispensable for a certain plant to complete its life cycle, directly affecting its productivity. The most important natural nutrients required for plant development are: (i) primary macronutrients: N (nitrogen), P (phosphorus) and K (potassium), which, when mixed together, are also known as NPK formulas; (ii) secondary macronutrients: Calcium (Ca), Magnesium (Mg) and Sulfur (S); and (iii) micronutrients: Boron (B), Chlorine (Cl), Copper (Cu), Iron (Fe), Manganese (Mn), Molybdenum (Mo), Zinc (Zn), Cobalt (Co), Silicon (Si) and other elements that may be defined by scientific research, expressed in their elementary forms. - Classification of Fertilizers: Fertilizers are classified by the nature of their composition, the quantity of nutrients they contain and the type of primary macronutrient by which they are characterized. - Population growth and limited availability of arable land: According to UN data, global food consumer population is expected to grow by about 75.0 million per year, as a result of which, the amount of arable land is decreasing, thereby creating greater need for more productive use of arable land to increase the crop yield, which is only possible with the aid of fertilizers together with other technologies. Thus, due to the historically low levels of grain stock throughout the world, demand for fertilizers is expected to continue growing. The increase in the world urbanization has also contributed to the increase in the food consumption. - Growth of per capita GDP in developing countries: Demand for fertilizers is strongly tied to the population’s income and standard of living. As the wealth of the population increases, so does its consumption of food and meat. An improvement in the quality of food entails production of more efficient fertilizers. The production of calories from meat requires much higher production of grains than equivalent calories coming merely from grains themselves. As a result of these tendencies, the production of grains and consumption of fertilizers are expected to grow faster than population growth. - Potential exploitable land: According to FAO data, there are nearly 630 million hectares of arable land in the world that are currently untouched. Planted areas throughout the world are expected to continue to expand rapidly, especially in Brazil, one of the world’s largest producers of grains, sugarcane, meat, coffee and low-cost forest products. 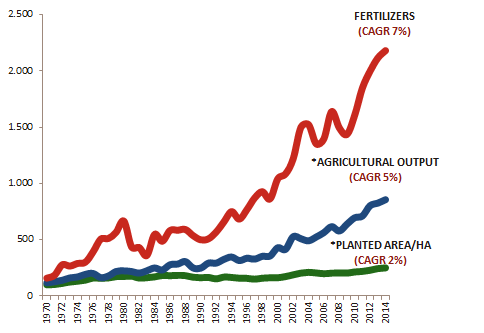 The expansion of planted areas leads to an increase in demand for fertilizers. - Agricultural Economy: The economic health of farmers is a determining factor in the use of fertilizers, as farmers have strong economic incentives to use fertilizers. Producers with low margins may reduce fertilizer consumption, which may production levels. The correct application of fertilizers may significantly improve crop yield. Government policies can help increase the profitability of producers and, in turn, the consumption of fertilizers in the coming years. Due to the fact that agribusiness accounts for a significant part of the Brazilian economy, the government offers farmers several credit policies, such as Funcafé, Proger Rural and Poupança Rural, providing farmers with greater investment possibilities and influencing the acquisition of fertilizers to improve production. - Renewable energy: Renewable energy is one of the topics currently being discussed in the agribusiness sector, given its great strategic value for the entire world. At the same time when all the countries are working to increase energy supply while reducing costs, there are also concerns about sustainability and the environment. An excellent example of an alternative source of liquid fuel in Brazil is ethanol (one of the manners in which sugarcane can be used, as explained above). Currently, Brazil produces the cheapest ethanol in the world and is recognized for the technology developed over the years, thanks to the domestic industry. According to the National Fertilizer Association (ANDA), fertilizer deliveries in Brazil totaled 32.2 million tonnes in 2014, 4.9% up year-on-year. Concerning nutrients, deliveries of nitrogen fertilizers (N) climbed by 4.7% due to increased demand for second-crop corn, cotton, coffee and wheat. Deliveries of phosphate fertilizers (P2O5) grew by 2.4%, mainly fueled by soybean. Deliveries of potassium fertilizers (K2O) climbed by 5.9% driven by higher deliveries of formulations and simple elements, particularly for second-crop corn, cotton, wheat and soybean crops. Brazil is the world’s 4th largest consumer of nutrients for fertilizer formulations, only falling behind China, India and the United States. Brazil is the world’s fourth largest consumer of nutrients used in fertilizer production, equal to nearly 5.9% of global consumption, behind only China, India and the United States. The fact that the growth in demand for fertilizers has surpassed Brazil‘s production capacity makes the country vulnerable to variations in prices in the international markets, exchange rates, shipping costs and logistical problems at Brazilian ports. Increasing the domestic production’s share of total sales will require investments in production (subject to geological limits) and logistics infrastructure (transport, warehousing and ports). Domestic production mainly depends on the price received by farmers (income), in addition to the relative price of fertilizers (exchange ratio), agricultural policies (loans, minimum prices, etc. ), future price expectations and the evolution of agricultural technology. According to ANDA, the country’s 2014 harvest registered a 7% compound annual growth rate (CAGR) in fertilizer consumption compared to the 1970 harvest. When used correctly, fertilizers contribute a lot to the environment because there will be a bigger area for plantation and consequently higher production. Aware of its responsibility to promote an efficient and sustainable agriculture, Fertilizantes Heringer S.A. develops and commercializes products for vegetable nutrition, contributing to the production of enough food to supply the demand of the increased population, as well as to a higher level of agricultural productivity, avoiding new areas to be deforested to implement agriculture activities. The Brazilian fertilizer industry underwent a significant process of consolidation in recent years when small regional companies were acquired, lost market share or left the market. Heringer’s growth followed the concentration of the NPK market and we are among the three largest fertilizer companies in Brazil, with market share of 17.1% in 2014. Our main competitors are Yara, Fertipar and Mosaic. 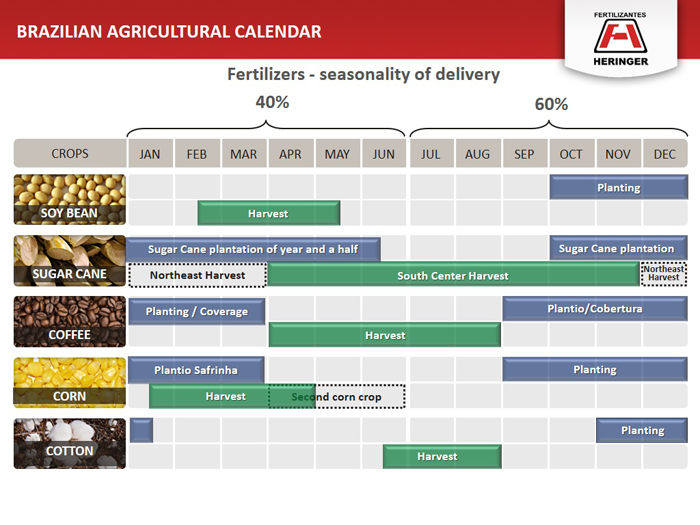 Fertilizer consumption in Brazil is concentrated in four major crops: soy, corn, sugarcane and coffee. The increase in fertilizer consumption is a fundamental driver for increasing agricultural productivity. Planted areas and fertilizer application rates in Brazil have been expanding as a result of solid grain prices, improvements in transport and adequate conditions for growth (climate and soil).